Turkmenistan's President Kurbanguly Berdymukhamedov is abolishing the names of days and months introduced by his predecessor, state media have reported. Due to popular demand, the Turkmen calendar will revert to its Turkic and Russian-language names. 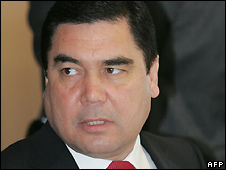 Former President Saparmurat Niyazov, who died in 2006, had named January after his own honorific - Turkmenbashi, or Father of the Turkmen. Other months and days were named after his mother and historical figures. The change is one of several reversals of his predecessor's autocratic legacy that President Berdymukhamedov has hinted at. He has given few details, but has said that "profound politico-juridical change" is coming. On Thursday he promised reforms to the constitution established by Mr Niyazov, Turkmenistan's first ruler after independence from the Soviet Union in 1991. Mr Niyazov was known for his eccentric cult of personality. He used the country's oil and gas wealth to build golden statues of himself around the country, a theme park based on Turkmen folk tales, and made his book - a "spiritual guide" called the Rukhnama - compulsory reading for students and workers. In his calendar, Saturday was Rukhnama Day and April was named after his mother, who died in 1948. "Names of months and days have to comply with international standards," Mr Berdymukhamedov was quoted in state media as saying.